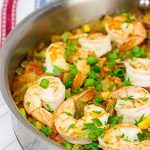 This Lowcountry Shrimp Perloo is a classic Southern recipe. It's easy, delicious and perfect for a weeknight meal! Using a large stockpot (with lid) or Dutch oven, add bacon and place pot over medium heat; cook until bacon is crispy. Transfer bacon to a paper-towel lined plate and pat dry. Reserve 2 Tbsp of bacon grease in pot. Add onion, garlic, celery and bell pepper. Cook for 6-8 minutes over medium heat, stirring occasionally, or until onions are translucent but not browned. Add crushed tomatoes, rice, corn, stock and Cajun seasoning. Stir and increase heat to medium-high. Bring to a boil. Add shrimp to top of rice. Cover pot and cook over medium-low heat for 5-8 minutes, or until shrimp are pink and fully cooked.